I picked up a 56cm Allez last summer and try as I might could not get it to fit (I usually ride a 23" frame) I might have found a 58cm Sirrus and I am wondering what's the difference between these two Specialized offerings ?, they seem very similar to me and there is not allot of (US) catalog info online, any Specialized experts want to weigh in? It varied depending on the year. some Sirrus bikes had rack mounts(your blue example) while others only had fender mounts. some years in the late 80s and early 90s the geometry was the same between the Sirrus and allez and some years the Sirrus was more relaxed. 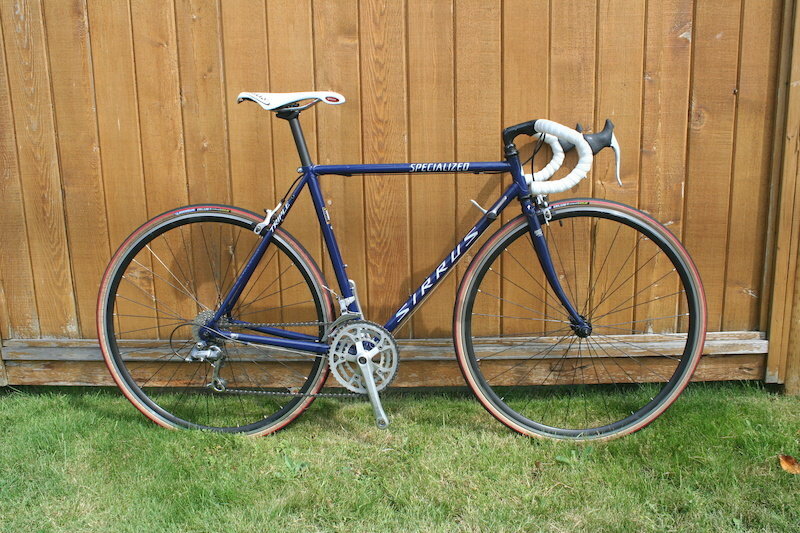 the allez had multiple models- carbon lugged, light cromoly, etc. From the 3 arly 90s Sirrus road bikes I have refurbished, they were all heavy feeling cromoly. so...it totally depends on the year what the differences were. Depends on the year. My '85 Allez and my '86 Sirrus are identical in weight and as near as I can tell geometry. My '90 Sirrus differs slightly in geometry but weight is the same as the two older bikes. My '93 Allez is significantly lighter. If I were looking for a bike and found a Sirrus that fit I would grab it. My 85 Allez and 86 Sirrus are both 56 C to C on both the TT and ST. Angles are 74/74. The 90 Sirrus and 93 Allez both measure 56 center to top on the ST and 56 C to C on the TT. Angles are 73/73. As far as I know these are all 56cm frames. I have an 88 Allez and the catalog for that year. It looks like they state the same general geometry for both frames; the frames in the photos look the same except for paint. Tange Cro-Mo is inferred, but I have no decals or other proof, except on the unicrown fork, which does have Tange decals. Of course, there are major differences - the Allez had a unicrown fork and Shimano 600 Ultegra (not the seatpost). The Sirrus had a cast fork crown, and Shimano 105. The saddles pictured are different. Both came with Biopace rings and toeclips. Starting in 88 the Allez went lugged Carbon... I don’t believe the Sirrus did that. Thanks for the input folks, the Sirrus seller has gone silent on me. I may have to ride the 56 cm Allez sport some more after I get it rebuilt, I really want it to work but I think its just a tad too small. I think this is the one you really want. I have a Sirrus identical to blue one above. I think it's more like 60 or 62cm tho. If you can live with a "French fit" I would let it go cheap. Thanks @Insidious C 58 is kind of my French fit. I am a short legged, 30" inseam, long torso 5'11'' ish so a 58 is tight for stand over but great for tt length for me. The 1988 catalog shows the carbon fiber model as the Allez Epic, along with the regular Cro-Mo Allez and Sirrus.